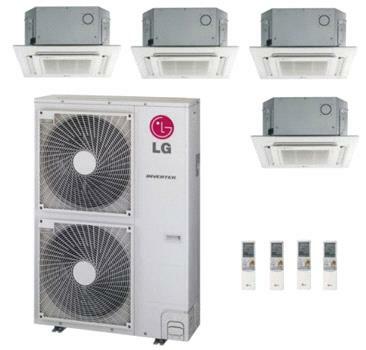 The LG Quad Zone Ceiling Cassette Heat Pump Mini Split System includes (1) LMU540HV 54,000 BTU Outdoor Condenser, (1) LMCN125HV 12,000 BTU Indoor Unit, and (3) LMCN185HV 18,000 BTU Indoor Units. This ceiling cassette system is designed with 4 zones and a rated capacity of 66,000 BTU/hour. The system comes with a total of 4 ceiling cassette indoor units. 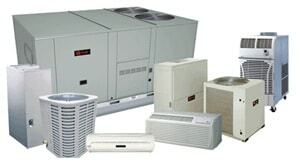 The quad zone system provides both heating and cooling to your home or business. 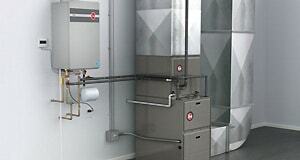 Revolutionary inverter technology minimizes energy loss improving the system's overall energy efficiency. Each indoor unit includes one remote control. This system bears a 17.2 SEER rating, a 10 EER rating, and an 8.7 HSPF rating. Ceiling cassette units feature a built-in condensate pump. Jet Cool operation allows rapid cooling of your rooms. A defrost control shuts down the indoor fan to prevent cold air from entering the house and removes frost from outdoor coils. Plasma air filtering reduces pollutant levels entering your home or business. Automatic operation and restart allows set levels of comfort set automatically and remembered after the system powers down. Ceiling cassette indoor units do not include PT-UQC grille. Inverter heat pumps use a variable speed compressor in place of standard constant speed compressors. Instead of shutting off at the set temperature, variable speed compressors continue to operate at low speed to maintain the desired temperature and save on energy costs. Defrost helps to remove frost from the outdoor coil during periods of low temperature. A corrosion resistant outdoor coil extends the service life of your outdoor unit. Temperature and fan speed set automatically within one of three comfort levels. Your system will automatically restart following a power failure. The drain pump drains away excess condensate fluid. This function allows a system to operate at high speed for 30 minutes to rapidly cool a room. By adding the required accessories to the Quad Zone Ceiling Cassette Heat Pump Mini Split System you are receiving a complete solution completely ready for installation, so your contractor does not need to purchase required LG accessories to finish the installation.